Shakti is worshiped as the Supreme Being. Shakti embodies the active feminine energy of Shiva and is identified as Mahadevi or Parvati. Shakti (Sanskrit pronunciation: [ˈʃʌktɪ]) (Devanagari: शक्ति; from Sanskrit shak, "to be able"), meaning "Power" or "empowerment," is the primordial cosmic energy and represents the dynamic forces that are thought to move through the entire universe in Hinduism. Sri Aurobindo:You aim at a result and your efforts subserve one that is different or contrary. It is Shakti that has gone forth and entered into the people. You aim at a result and your efforts subserve one that is different or contrary. It is Shakti that has gone forth and entered into the people. N Balasubramanyam:...It exists eternally associated with the male principle, Shiva, who plays a secondary role. The “Srichakra” is the diagrammatic representation of their union. India of the ages is not dead nor has She spoken Her last creative word; she lives and has still something to do for herself and the human peoples. And that which She must seek now to awake, is not an Anglicized oriental people, docile people of the West and doomed to repeat the cycle of Occident’s success and failure, but still the ancient immemorial Shakti recovering Her deepest self, lifting Her head higher towards the supreme source of light and strength and turning to discover the complete meaning and Vaster form of Her Dharma. The first and ultimate principle of the Universe is a feminine power, Shakti, whose personified form is Beauty and whose essential nature is consciousness and bliss. It exists eternally associated with the male principle, Shiva, who plays a secondary role. The “Srichakra” is the diagrammatic representation of their union. Although conceived as female in nature, Shakti is not an individual goddess, but rather a dynamic quality that all goddesses (and even all women, at least within the Shakta Tatric tradition) are said to possess. Unbridled, uncontainable. The Guru [Nagaji, Ramakrishna’s] would, never condescend to admit of Maya or Shakti. Brahman only exists – this was his refrain. Ramakrishna on the other hand, had begun his spiritual ascent by his devotion to Shakti standing in the form of the idol of Kali in the temple. To him Shakti was equally real and equally important. Without any argument, or any effort on his part, his guru was caught in the vice like grip of Shakti or Maya. Bhadrakali - Dushyanta Pandya:...This symbolizes the fact that every action, big or small, of destruction or creation, performed by Kali at the instance of Shiva. Kali, as it were, is the working organ of Shiva. Shiva and Kali, Brahman and Shakti, the source and energy, are essential one. There is a deeper symbolism. The black image of Kali is standing on the white image of Lord Shiva. Shiva is Brahman and Kali is Brahman’s energy, Shakti. Brahman is passive while Shakti – Kali –is active. The images so stand that Shiva looks at Kali and Kali at Shiva. This symbolizes the fact that every action, big or small, of destruction or creation, performed by Kali at the instance of Shiva. Kali, as it were, is the working organ of Shiva. Shiva and Kali, Brahman and Shakti, the source and energy, are essential one. Why is it that our country is the weakest and the most backward of all countries? Because Shakti is held in dishonour. Without the grace of Shakti nothing is to be accomplished... To me, Mother's grace is a hundred times more valuable than Father's... fie on him who has no devotion for the Mother....If an Indian woman in Indian dress preaches the religion which fell from the lips of the Rishis of India, it will inundate the Western world. Will there be no women in the land of Maitreyi, Khana, Lilavati, Savitri and Ubhayabharati? Mantra is like atomic power, the more you explore the Shakti, the power, the atomic energy, in the atom, you will the Shakti is even subtler than the atom itself. So from where does our lineage of tradition flow? The first is Brahmadeva, the lotus-born one. Then came Vasishta, Lord Rama’s Guru. This indicates that tradition is older than the Ramayana. After Vasishta comes Shakti, then Parasara, followed by Vyasa, author of the epic Mahabharata, and then Shuka. All the objects in the external world are definitely projections of shakti, the power of consciousness, but the waking state is not a product of your mind. The word shava, means corpse. What is this word? Why is it called shava? It is missing something, it is missing shakti. Shiva without shakti, become shava. The very thoughts like: ‘I am meditating,’ ‘I am thinking on the Absolute,’ are within the realm of Shakti. They are the manifested powers of that Eternal Energy. Therefore the Absolute Brahman and the Eternal Energy are in separable and one. The existence of one implies that of the other, as the fire and its burning power. If you accept the existence of fire, how can you deny its burning power? No one can think of fire without thinking of its burning power. In the same manner, we cannot think of the rays of the sun, without thinking of sun himself. Again, we cannot think of sun without thinking of his rays. Therefore, no one think of Brahman as apart from Shakti, or Shakti as separate from Brahman. Likewise, no one conceive of the phenomenal as independent of the Absolute, or of the Absolute as apart from the phenomenal. The same Eternal Energy, the Mother of all phenomena, is creating, preserving, and destroying everything. 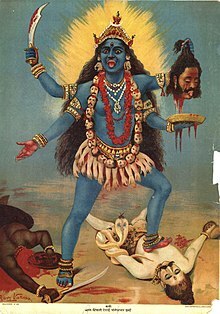 She is called Kali, the Divine Mother. Kali as Brahman, Brahman as Kali, one and the same Being. I call him Brahman when He is absolutely inactive; that is when He neither creates, nor preserves, nor destroys phenomena; but when He performs all such actions, I call him Kali, the Eternal Energy, the Divine Mother. They are one and the same Being, the difference is in the name and form, just as the same substance water is called by different names in different languages such as jal, water, pani, etc. A tank may have four ghats. The Hindus drink at one ghat and call it jal; the Mohammedans at another and call it pani; while the English who drink at the third call it water. Similarly, God is one, only His names are different. Some call Him by the name of Allah, some God, some Brahman, other Kali, others again Rama, Hari, Jesus, Buddha. Shakti is the supreme, unchanging and spiritual truth that is beyond time and space. Shakti is the essence of chaitanya, or its true self; she neither male, nor female, but is a male-female entity, i.e. pure intelligence. Shakti is otherwise called vimarsha which is the eternal spirit of chaitanya. Shakti is self-existent and all manifest in the form of creation and dissolution. Like the [[w:Para Brahman|para-Brahman of the Vedanta, this shakti is also pure intelligence. From the tantric point of view Shakti and Shiva are but one and the same, thus essentially differing from the Maya of the Vedanta. Shaktism expounds that the manifestation of the non-ego appears as external to shuddatma or pure ego and that chit-shakti is beyond the nescience. Shakti worship, especially the worship of God as Mother, is a personal property of India. The great scholar and illumined soul Swami Abhedananda also says, ‘India is in fact the only place in the world where God is worshipped as Mother’. Swami Saradananda, in "Shakti Worship and Sri Ramakrishna". Narasingha Prosad Sil: Shakti: the Mother Goddess, power or energy, originating, perhaps, in the non-Aryan culture of the Indus Valley. Mythologically Shakti is equated with the Goddesses Kali, Parvati and Durga, consorts of Shiva. The cult of Shakti flourished since the fifth century A.D.
Shakti: the Mother Goddess, power or energy, originating, perhaps, in the non-Aryan culture of the Indus Valley. Mythologically Shakti is equated with the Goddesses Kali, Parvati and Durga, consorts of Shiva. The cult of Shakti flourished since the fifth century A.D.
Sir John Woodroffe, in "Shakti Worship and Sri Ramakrishna". ...Brahman and Shakti are identical. If you accept the one, you must accept the other. It is like fire and its power to burn. If you see the fire, you must recognize its power to burn also. You cannot think of fire without its power to burn, nor can you think of the power to burn without fire. You cannot conceive of the sun’s rays without the sun, nor can you conceive of the sun without its rays.... You cannot think of the milk without the whiteness, and again, you cannot think of the whiteness without the milk. Thus one cannot think of Brahman without Shakti, or of Shakti without Brahman. One cannot think of the Absolute without the Relative, or of the Relative without the Absolute. The Primordial Power is ever at play. She is creating, preserving and destroying in play, as it were. This Power is called Kàli. Kàli is verily Brahman, and Brahman is verily Kàli. It is one and the same Reality. When we think of it as inactive, that is to say, not engaged in the acts of creation, preservation, and destruction, then we call It Brahman. But when It engages in these activities, then we call It Kàli or Shakti. The Reality is one and the same; the difference is in name and form. Sri Ramakrishna experienced Shakti, the presence of the Divine Mother in everything. And lo! The whole scene, doors, windows, the temple itself vanished. It seemed as if nothing existed anymore. Instead I saw an ocean of the Spirit, boundless, dazzling. In whatever direction I turned, great luminous waves were rising. They bore down upon me with a loud roar as if to swallow me up. In an instant they were upon me. They broke over me, they engulfed me. I was suffocated. I lost consciousness and I fell... How I passed that day and the next I know not. Round me rolled an ocean of ineffable joy. And in the depths of my being I was conscious of the presence of the Divine Mother. The Shakti or Power of Brahman is the manifest aspect of the unmanifest Brahman, the personal aspect of Impersonal Brahman. Brahman and Shakti are inseparable: they are static and dynamic, like energy bottled up and energy released. The one cannot be conceived of without the other: Brahman is inconceivable without Shakti, Shakti is inconceivable without Brahman. It follows that Brahman is a cosmic and cosmic as well as transcendental and relative. These seemingly opposing aspects — unmanifest and manifest, static and dynamic, acosmic and cosmic, transcendental and relative—are identical. In each case the same Being is seen from different viewpoints which balance and supplement each other. Both concepts, Brahman and Shakti, are indispensable to the health and fullness of spiritual life. There was the other idea in the old Vedic hymn to the Goddess: ‘I am the light. I am the light of the sun and moon; I am the air which animates all beings.’ This is the germ which afterwards develops into Mother-worship. By Mother-worship is not meant difference between father and mother. The first idea connoted by it is that of energy—I am the power that is in all beings. In an old Veda is found the mantra, ‘I am the empress of all that lives, the power in everything. ’Mother-worship is a distinct philosophy in itself. Power is the first of our ideas. It impinges upon man at every step; power felt within is the soul; without, nature. And the battle between the two makes human life. All that we know or feel is but the resultant of these two forces. Man saw that the sun shines on the good and evil alike. Mother is the first manifestation of power and is considered a higher idea than father. With the name of Mother comes the idea of Shakti, Divine Energy and Omnipotence, just as the baby believes its mother to be all powerful, able to do anything. 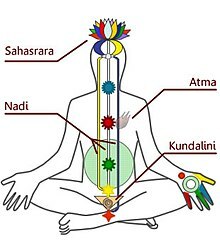 The Divine Mother is the Kundalini (“coiled up power”) sleeping in us; without worshipping Her we can never know ourselves....Every manifestation of power in the universe is ‘Mother’. She is life, She is intelligence, She is love....A bit of Mother, a drop, was Krishna, another was Buddha, another was Christ....Worship Her if you want love and wisdom.